29.04.2019, 11:14 za 4 dni 2 godz. 44 min 55 sek. 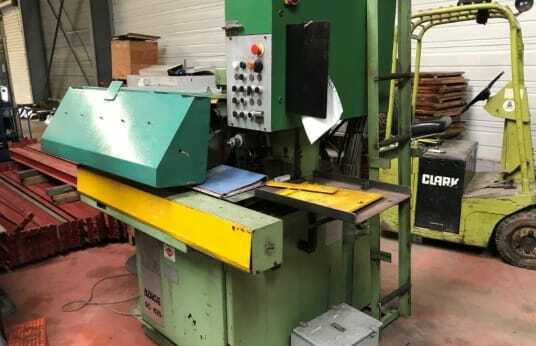 Sawing machine for straight and mitered profiles with automatic feed, Diameter of saw cutters 425mm, Capacity in round 145mm, Capacity in flat 340x50mm, Cutting speed: 14 to 220m/min - Capacity in square: 130mm - Automatic feed length: 5 to 1400mm - Capacity at 45°: 200x75mm - Bow tilting: 45° - Hydraulic control: yes - Motor: 6cv/min, Stock number 91364. ATTENTION: Machine loaded by overhead crane.